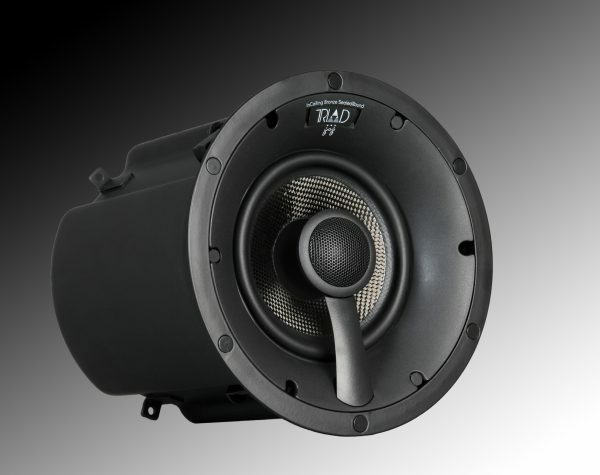 Triad’s mid-sized enclosed ceiling speaker has a lot to offer at a reasonable price, both in performance and looks. The InCeiling Bronze SealedRound features a quality cast basket carbon fiber woofer, and an adjustable and aimable tweeter for greater clarity at the listening position. The engineered, sealed steel enclosure offers superior isolation from adjacent rooms and delivers predictable sound quality every time. The speaker can retro-fit into an existing ceiling, and new construction brackets are also available. Installation is simple and straightforward. Custom paint matching of the grill is available from Triad, at a modest cost. For installations where sound isolation and sound quality are important, Triad’s new InCeiling Bronze SealedRound delivers exceptional performance and value with an elegant, unobtrusive appearance.